Previously, there were two competitors in the market of Basal Insulin treatments, Levemir and Lantus. But this market has since included some newcomers, including that of Tresiba. Basal insulin treatments are used for both patients with type 1 and type 2 diabetes over the age of 18. How does this new kid to the basal gang compare to others on the market? 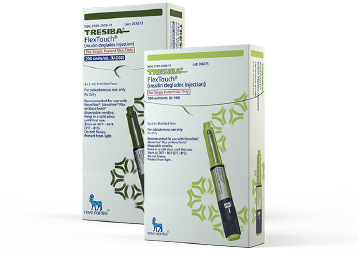 Tresiba is a once daily injection that comes in FlexTouch insulin pen form. Unlike Lantus, Tresiba works for up to 42 hours, offering you better flexibility with meal planning. During a clinical study, those with Type 2 diabetes, adults were able to vary their daily dose time and still maintain blood sugar control when compared to Lantus. This study determined that adults who have type 2 diabetes still were able to vary their dosing schedule with Tresiba by 8 to 40 hours with no complications to their blood sugar control. Taking Tresiba at differing times still provided the same type of control that taking Lantus at the same time each day provided. NOTE: When taking Tresiba at different dosing times, it’s important to always ensure that there is at least eight hours between doses. When comparing Tresiba to Lantus for adults with Type 1 diabetes, the study determined that when taking a once daily injection of Tresiba in combination with fast-acting insulin for meal times, Tresiba and Lantus both provided similar results in blood sugar control. Do NOT Share: Because Tresiba comes in the FlexTouch pen format this medication should never be shared between more than one patient, even if you change the needle. Sharing medications in pen format expose patients to the potential risk for the transmission of blood pathogens. Hypoglycemic Control: Blood sugar levels should be monitored at all times when Tresiba is used. Insulin use can affect your blood sugar control this is why it is vital to make sure you are constantly monitoring your levels to prevent hypoglycemic and hyperglycemic episodes. Hypoglycemia can be potentially life-threatening and should be treated appropriately if it occurs. Make sure you are not making changes or adjustments to your dosage of Tresiba on your own, but instead with your physician. Allergic Reaction: Severe sometimes life-threatening anaphylaxis can occur when you are using insulin products. If you notice you experience any allergic reactions when starting this product, make sure you contact y our doctor immediately. Tresiba is approved for usage in children with Type 1 or Type 2 diabetes who are 1 year of age or older. However, pediatric patients who are not yet using at least 5 units of Tresiba for their daily dose of basal insulin cannot use Tresiba. Make sure you speak with your child’s doctor to find out what their recommendation would be for the use of Tresiba. But typically pediatric patients who start taking Tresiba start at 80% of their current basal use to reduce the risk of hypoglycemic episodes. For children with Type 1 diabetes, doctors recommend starting at 1/3 to ½ of their total daily dose (TDD) of basal insulin. When compared to other basal insulin pen formats, the Tresiba offers a lower extension of the push button. This makes it much easier to inject with for younger pediatric patients who are able to do their own injections. When considering switching to Tresiba, it’s important you speak with your doctor first to get their recommendation on if this basal treatment option would be beneficial to you. Overall, Tresiba seems to be a good choice for those who need greater flexibility in their insulin regimen. If you’ve already made the switch comment below and let us know what you think about this insulin. Is this better then Levemir ? This is not a response to the question posted by David Concannon. I’ve never used Levemir. This is a separate comment about my own experience with Tresiba. Today is April 25, 2018. I have had T1D for just over 42 years. I started on Tresiba back on January 2, of this year. I do find that it is more effective by far than Lantus was, at keeping my sugars level between meals. However, there is a bit of a long learning curve when you switch to this insulin from another. It took many weeks for my body to adapt to the new insulin. There was itching and mild hives, but this subsided after several weeks. There was also MUCH slow and methodical “tinkering” required, to achieve the appropriate dose for my life. (1) Tresiba seems to make you require much less bolus insulin (mine is Humalog, via multiple daily injections), especially when you plan any large muscle activity, even something like a long, brisk walk or vigorous housework. (2) If you have misjudged your meal bolus and your sugar is on the high side later on, Tresiba is so stabilizing that it will maintain that higher level. ALWAYS use extreme caution when giving yourself a correction dose of short-acting insulin. I neither love nor hate Tresiba. I do appreciate its level action. I feel hungrier and have gained weight since starting on it. That is not a thing I like. Hope this bit of personal insight is useful for someone out there. We need each other. I was on Tresiba for a short time and I gained weight which, being a vane female I did not like!!! Type 1 now for 57 years & I didn’t find any benefit when using tresiba. Thank you for your comment. My doctir gave me a sample to try. I have a hard enough time with weight gain and will decline the Tresiba and stick with Lantus. I am a Type 2 diabetic. I made the switch from Lantus to Tresiba in the last month. I have not liked the immediate results. I have gone to bed with a blood sugar of 150, taken my nighttime does of Tresiba, and then woken up at 5am with a blood sugar level of 30. It only begins to stabilize in the afternoon and at that point I’ve already dealt with lows. This has happened many nights now and I am going to have to try and adjust my nighttime dose… meaning lower it substantially. Be cautious. I appreciate all of your comments, I’ve been a type 1 diabetic for 54 years and am taking Levimir at the moment but my Dr. mentioned Tresiba so I am considering switching but after all the comments I’ll have to think about it a bit longer. Thanks to all of you. I have been on Tresiba for nearly nine weeks now. My blood sugar was high, over 300. Now I’m running in the 80’s to 180’s at times. But, it’s hard for me to find a good time to check my blood considering I’m up at 2 or 3 AM every morning and going to bed at 7:30 or 8:30 PM. This is still something I’m working on. Overall, my blood A1C’s have dropped from 11.9 to 7.7, and I’m really not gaining much if any weight. I am overweight, and my family has a history of being large. Many have passed from side effects of diabetes, and I don’t want to be one of them, so I AM going to be treating mine. Though I don’t like injections, Tresiba has been a fairly decent thing for me. I will still be holding any recommendation until more time has passed, but I would say that it seems to work better than other things I have tried. I am a T1D for 20 years. I switched to Tresiba 4 months ago, my DN decided on 28 units each 24 hours and it works fine for me. Interestingly, I have lost all my warning signs bar two  when I shut my eyes I get a blinding white amorphous shape [like I have just looked at the sun] and  I see a little flutter in the middle of what I am looking at. All the very best to you all.